We asked a few of our subscribers to share their thoughts on the opening of the Fertitta Center. The three accounts below are from long-time Cougar fans and each offers a unique perspective on this historic night. My first impression of the Fertitta Center: I am very impressed and excited that we will all be able to enjoy watching games here for years to come. They did an outstanding job. 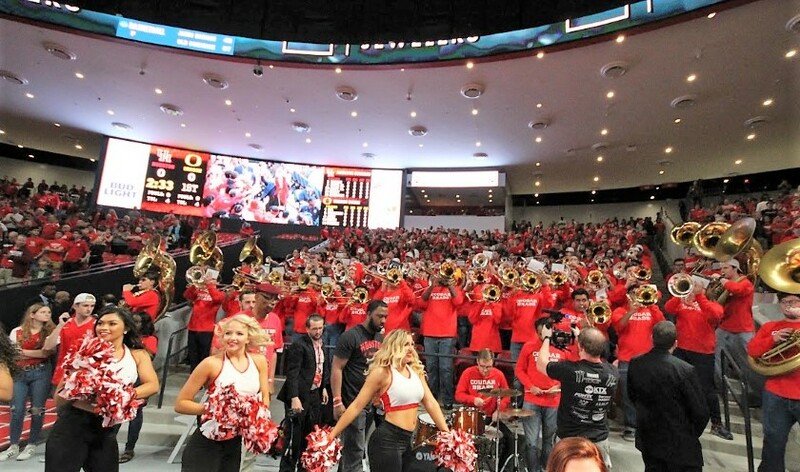 More than that, I am very optimistic that between the facilities and the leadership of Coach Kelvin Sampson, we will likely be winning at a high level (making the NCAA tournament) for at least the next five years. I just missed the Phi Slama Jama era. I started at UH in the fall of 1985 after UH lost in the championship to Georgetown the previous spring. And while we’ve had some very good players and teams since then, we’ve also had a lot of mediocre to bad teams. 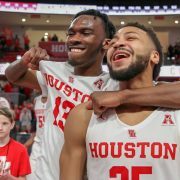 Over the last 20 years, the poor condition of Hofheinz made it really hard to be optimistic about the basketball team having any sustained success. It’s not an overstatement to call the Fertitta Center a game-changer. Honestly, I’m still worried about fan support. I really hope we all respond to the renovated arena and winning team and attend games in much greater numbers than we’ve had prior to last Saturday. If we can get consistent good crowds, that is the final piece to really getting this program to take off, IMO. 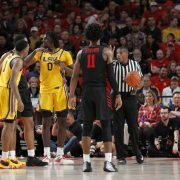 College basketball has been my favorite spectator sport since I was young and the historical success of our program was actually one of the factors that drew me to UH for college. I was here during the last 2 years of Phi Slama Jama, so you can imagine the high bar that was set for me regarding our hoops program. 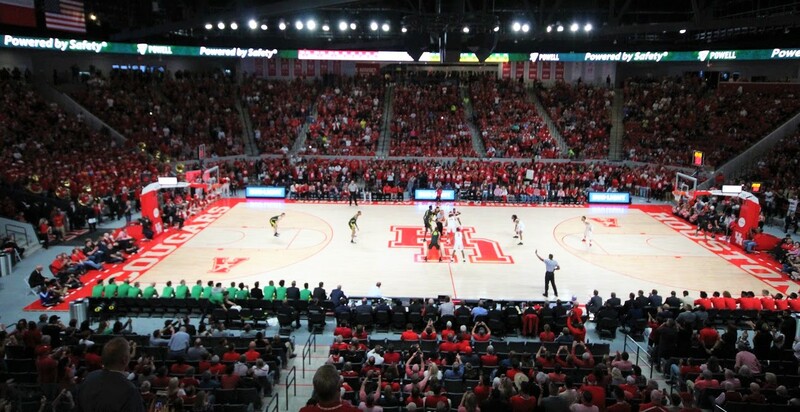 Those were heady times in Houston, with lots of history and incredible memories from games in Hofheinz Pavilion. But if we’re being honest, even in its heyday Hofheinz was somewhat dark and sterile, with the oval set-up placing seats too far from the action. But it was the 80’s, and the arena was still on par with most leading college programs in the country at the time. Plus, it was really the great basketball from that era that stuck with me through the years. And my most memorable game of all time, the nationally televised game against Virginia and Olden Polynice. To this day, I have never experienced a sporting event that deafeningly loud. 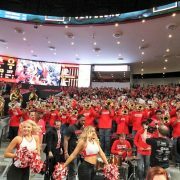 Wonderful memories were what really made Hofheinz. 1. When we lost to NC State in the NCAA Finals – I was devastated for months. 2. 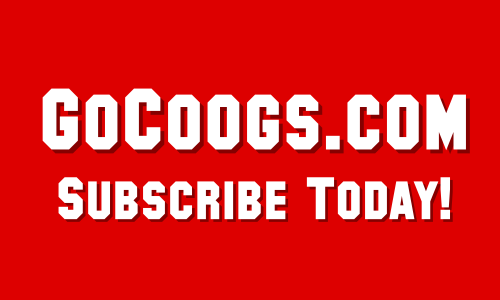 When Tom Herman addressed our fans after the Peach Bowl win with “Coog Nation is back!” – I couldn’t stop the tears from welling up since I felt like we had finally come back from the depths of irrelevance. Was I going to get choked up about the transformation of the home to my favorite Cougar sports team? My wife and I flew in from Northern California the morning of the game and arrived 1 hour early so we could take everything in. Even though I knew it was going to be a sellout, I was still surprised that the whole arena was already hopping when we got there. Everything about the Fertitta Center and our opening-night was incredible. We really paid attention to the details when building our new home. A huge video board behind each basket, an around-the-arena video ribbon that highlighted every possible statistic you could want during the game, a modern club area that’s built “mid-tier” to ensure the best sight lines and amenities for our high rollers, and a prime time student seating area that’s as close to the action as possible. It is simply a spectacular arena. 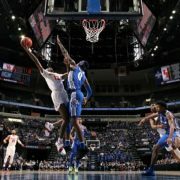 And the event itself – with the professionally done 3-D laser show, rockin’ team intro video, DJ pumping out incredible tunes throughout the night, and the well-stocked concession stands that were properly staffed – actually felt like I was at an NBA game. But with the loud and enthusiastic college crowd. Truly the best of both worlds! So with our sparkling new arena, an incredible event orchestrated for opening night, a full house for the first time since probably Drexler was coach, and then a win over the 18th-ranked team in the country, I’d be lying if I said I didn’t get a little welled up with pride. But I’ll tell you what, the feeling I had that overrode everything else was simply being AWESTRUCK. Folks, along with the Guy V. Lewis Development Center, our new arena is a game changer. 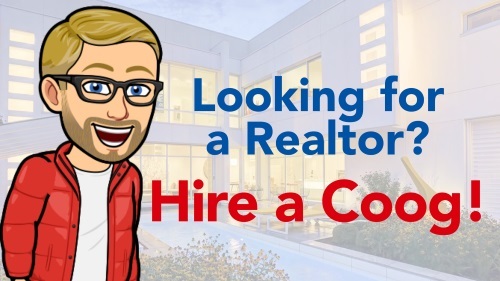 It is the perfect sized arena for us in order to drive demand. And I love the fact that we kept the “bones” of Hofheinz, along with the oval configuration of the baseline sections behind the baskets. Our coaches and facilities now in place for basketball are second to none, so get ready for an incredible ride. As an out-of-towner with season tickets that flies in for 4-5 games a year, I would highly encourage those still on the fence to jump aboard. I believe this basketball program will be our calling-card to national relevance as an athletics program again. This sleeping giant has been reawakened! Now I understand how the “first generation” of Cougars felt when Hofheinz Pavilion opened in 1969. Moving to Hofheinz from Jeppesen Fieldhouse and Delmar must have been akin to waking up and finding yourself in Heaven unexpectedly. The Fertitta Center is also that shocking. If you had asked me in 1988 or 1998 or 2008 whether we’d play any sport in a place as fabulous as the Fertitta Center, I’d have said “no” unequivocally. Simply no chance. Heck ten years ago, our facilities were in the bottom half of C-USA. Now we’re playing in a basketball arena every bit as modern as the Toyota Center. And it’s different than TDECU. TDECU, while a huge upgrade to Robertson Stadium, it is still pretty “no frills” outside of the suites and the Club. Fertitta Center, on the other hand, is a premium experience at at every spot, in every seat, at every turn. When you’re my age or just a little younger, you can remember Hofheinz Pavilion in its greatest glory. 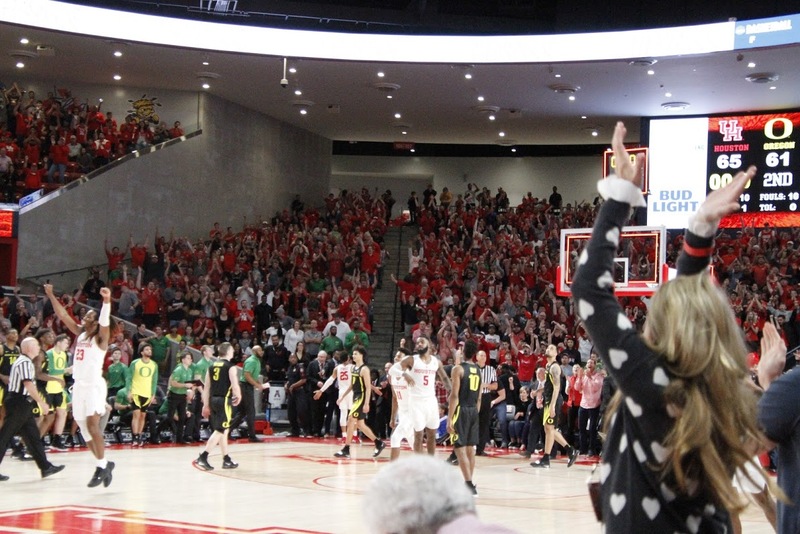 When the guys whose numbers now hang in Fertitta Center were college students, playing on the old tartan floor in front of thousands of people, and thousands of whom were students. We expected to Dance every year even before it was ever called The Dance. Indeed, we were playing in Hofheinz when UT was still playing in Gregory Gym, A&M was playing in G Rollie White, and Barnhill Arena was a dump. We were so far ahead of our competition. But those days are as far in the past as the fall of the Berlin Wall. And frankly, I assumed never to be experienced again. But here we are, once again in as modern a place as Hofheinz ever was. As I was walking in on Saturday, I ran into to Debbie and Randy Randel. I knew that Randy had been a student when Hofheinz opened decades ago. I joked with him tht he was one of the few folks around that had been to both openings. Without missing a beat, he said that he was pretty sure that he wouldn’t be around for a third opening night. I’m in that same boat, but I’m really, really glad to have been to this one.